Please stop by a great on-line magazine, The Gift of Stitching. Every month Kirsten Edwards, of Sydney, Australia, has a nice mix of traditional and contemporary designs, that are beautifully photographed, along with charts and interesting interviews with designers from all over the world. 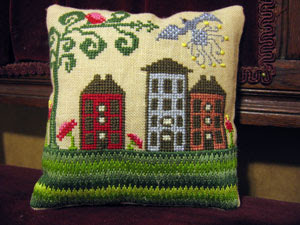 She has graciously chosen my desgin "Red and Blue Houes" to be among many other featured desgins in the February issue. You can see a little peek here, February 2010. Emily, you are quickly becoming one of my favorite designers. I love the combination of colors you use and the designs. I can't wait to start "Red and Blue Houses" I just love it ! !